Last year I designed the awards - A wonderful idea from Mapihi Opai Fashion NZ (FINZ) and so I was chuffed to be asked again this year. 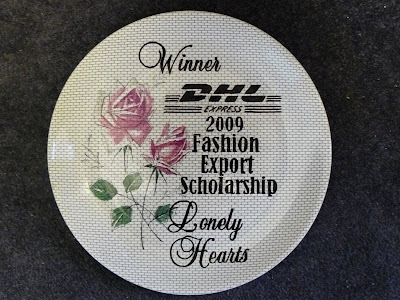 Bit of a challenge getting all that onto the Crown Lynn dinner plates but a nice result I think...Congrats to Lonely Hearts, the 2009 winner! nice work! And I'm sure the Lonely Hearts gals would have been pretty chuffed with getting such an awesome looking award too!